We charge a minimum of £7.95 for orders of 12 bottles or less, and for our wine gift boxes. A further £4 shall be added to your delivery charge for every 6 bottle case thereafter, unless otherwise stated. If your order consists of a combination of wine and gift boxes, then each gift box shall be treated as a 6 bottle case for delivery charge purposes. E.g. an order of 12 bottles of wine plus a gift box shall incur a delivery charge of £11.95. Orders for wine club membership shall be posted to you free of charge. 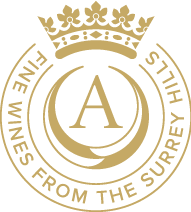 Tickets for events including pruning demonstrations, vineyard tour and tastings will be emailed to you. The maximum quantity you can order is 24 bottles. Please contact us if you wish to order more than this quantity. We currently deliver only to mainland UK. Standard delivery is 3-5 working days. You can collect your order from the vineyard on days and times that we are open. These options will be provided in a dropdown list at checkout.